In the art of rolling your own cigarettes, you’ll need tubes to fill your favorite tobacco blends in. We carry a wide variety of (RYO) cigarette tubes so that you can easily roll premium cigarettes that are better than any store bought ones! 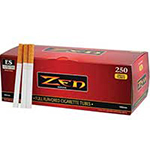 Cigarette tubes are simply empty tubes that are perfect for rolling your own smokes. You have the freedom to fill them with whatever tobacco blend you choose and can easily fill them with an injector or shooter. You can even be old school and fill them by hand! With your preferred tobacco brand on hand and your favorite tubes, you’ll be able to perfect the art of rolling your own smokes. You’ll also be able to control the quality of your cigarettes and enjoy smoking them for less than traditional options. While some smokers prefer paper, the vast majority of tubes since it features with a filter at the end, which makes smoking so much more enjoyable. They also come in a variety of sizes, including King and 100mm. You’ll be able to choose your preferred flavors and strengths, which often include menthols, full flavor, lights and ultra lights. Choosing the best cigarette tubes depends on a number of factors, including your smoking preferences. But ideally, you’ll want to invest in name brand tubes that won’t break, bend or crush easily. They should also be affordable since the whole point of rolling your own cigs is to save money! We have a wide selection of premium and affordable cigarette tubes from many of the industry’s top brands!